This Merola Tile Coppa Forest 12-inch x 12-inch x 4 mm Glass Mosaic Tile features a smooth, glossy finish with rich greens accented by gold and copper striations, giving the tiles the appearance of having mineral veining. The mesh backing makes it easy to install in any room in the home, as a complete wall layout or as a simple accent to other tiles to suit your design preferences. The vitreous water absorption makes the tiles suitable for outdoor use also for added versatility. Coordinate with matching grout to accent the rich colors of the mosaic. The Merola Tile Expressions Scallop Black 11-1/4-inch x 12-inch x 7 mm Glass Mosaic Tile is constructed of recycled pressed glass. The black fish-scale shaped chips feature mixed finishes for added dimension. With characteristics of unglazed porcelain tile, this mosaic is impervious and frost resistant. These mesh-mounted tiles offer a high durability rating that is great for any interior or exterior space. The Merola Tile Expressions Scallop White 11-1/4-inch x 12-inch x 7 mm Glass Mosaic Tile is constructed of recycled pressed glass. The white fish scale shaped chips feature mixed finishes for added dimension. With characteristics of unglazed porcelain tile, this mosaic is impervious and frost resistant. These mesh-mounted tiles offer a high durability rating that is great for any interior or exterior space. 2-inch x 6-inch Glass Brick Mosaic Tile in Arctic Fog Boutique selection of glass subway tiles with contemporary, cool tones for trendy settings. 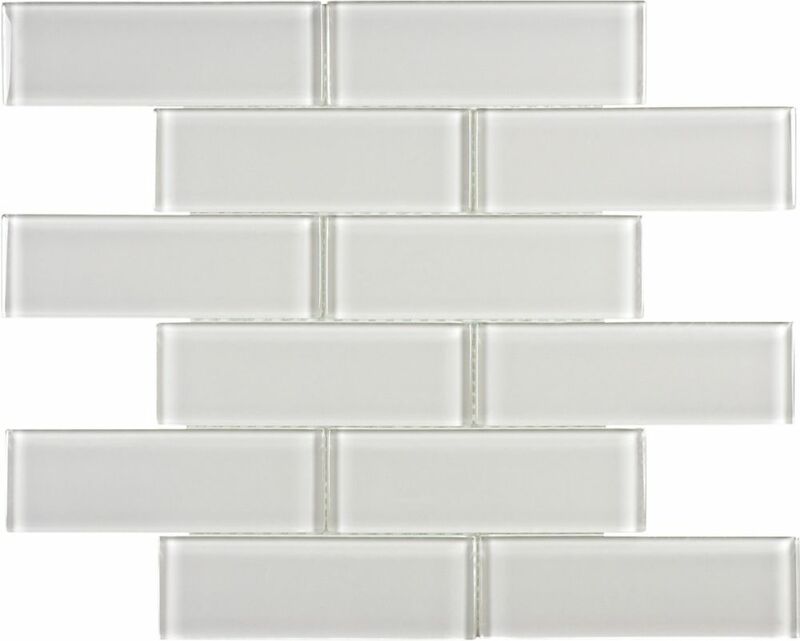 2-inch x 6-inch Glass Brick Mosaic Tile in Arctic Fog is rated 4.8 out of 5 by 4. Rated 5 out of 5 by Cubed from Beautiful We used these tiles as our kitchen backsplash, with white grout. They are beautiful. They are a light smoky grey, with a slight green undertone. Is it ok to use white mastic when installing these tiles ?